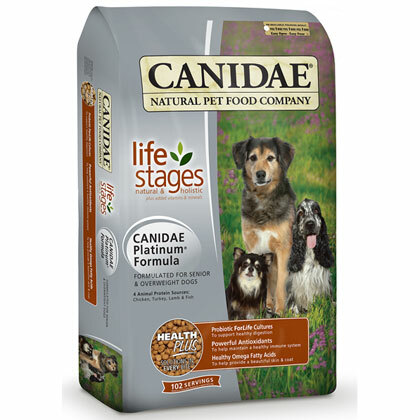 What is Canidae Platinum Seniors & Overweight Dog Dry Food? Canidae Platinum Seniors & Overweight Dog Dry Food is an all-natural dog food formula that is especially made for senior dogs and dogs that are overweight. 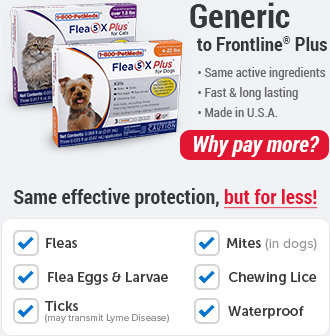 It may be suitable for dogs with sensitive skin and allergies, and some dog owners have found that it works well to improve their dog's sensitive skin and related allergy symptoms. Canidae Platinum Seniors & Overweight Dog Dry Food is made with four high quality meats meals, chicken, turkey, lamb, and fish, made from meats that are processed in a human grade facility. You'll also be happy to know that Canidae doesn't include corn, wheat or soy, so your dog won't be eating a lot of empty calories. And speaking of calories, Canidae Platinum has reduced fat, especially good for less active, older dogs and those carrying a little extra weight. 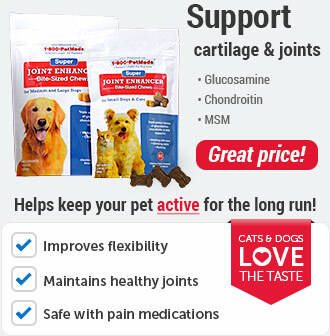 Canidae Platinum Seniors & Overweight Dog Dry Food also includes glucosamine and chondroitin to promote better joint health and psyllium for fiber intake and to help with digestion. Canidae Platinum Seniors & Overweight Dog Dry Food provides your dog with a well-balanced meal that is not only delicious, but also provides essential vitamins and antioxidants to help your dog feel healthy and energized. 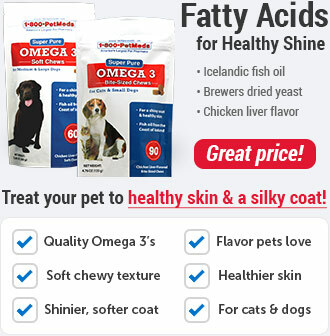 Added Omega-3 and Omega-6 fatty acids also help maintain healthy skin and coat, and the food is specifically formulated for dogs with allergies and food sensitivities. It contains natural ingredients, like chicken meal and a variety of low-allergenic grains that most dogs love, even the pickiest of eaters. Days 1 & 2: Feed 75% previous dog food and 25% Canidae Platinum Seniors & Overweight Dog Dry Food. 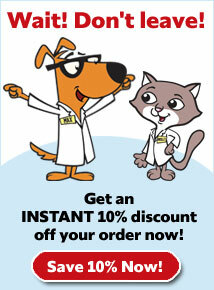 Days 3 & 4: Feed 50% previous dog food and 50% Canidae Platinum Seniors & Overweight Dog Dry Food. Days 5 & 6: Feed 25% previous dog food and 75% Canidae Platinum Seniors & Overweight Dog Dry Food. Day 7: Feed 100% Canidae Platinum Seniors & Overweight Dog Dry Food. These guidelines are the recommendations for feeding overweight and senior dogs with reduced activity levels and where weight gain is a concern. 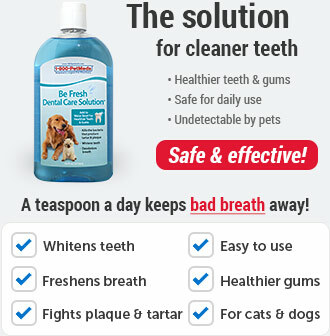 For best results, divide the daily recommended amount into two feedings daily. Always have plenty of fresh water available, and visit your veterinarian for regular check ups. 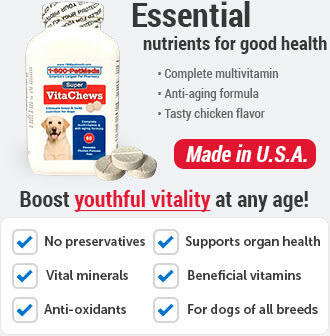 Ingredients: Chicken meal, brown rice, white rice, rice bran, peas, potatoes, oatmeal, cracked pearled barley, millet, turkey meal, lamb meal, chicken fat (preserved with mixed tocopherols), tomato pomace, natural flavor, flaxseed meal, ocean fish meal, choline chloride, glucosamine hydrochloride, chondroitin sulfate, psyllium seed husk, sun-cured alfalfa meal, inulin (from chicory root), lecithin, sage extract, cranberries, beta-carotene, rosemary extract, sunflower oil, yucca schidigera extract, dried enterococcus faecium fermentation product, dried lactobacillus acidophilus fermentation product, dried lactobacillus casei fermentation product, dried lactobacillus plantarum fermentation product, dried trichoderma longibrachiatum fermentation extract, vitamin E supplement, iron proteinate, zinc proteinate, copper proteinate, ferrous sulfate, zinc sulfate, copper sulfate, potassium iodide, thiamine mononitrate, manganese proteinate, manganous oxide, ascorbic acid, vitamin A supplement, biotin, niacin, calcium pantothenate, manganese sulfate, sodium selenite, pyridoxine hydrochloride (vitamin B6), vitamin B12 supplement, riboflavin, vitamin D3 supplement, folic acid, papaya, pineapple.